Installing Ubuntu 7.10 - Gutsy Gibbon step-by-step installation guide with screenshots! So you've heard about Ubuntu everywhere on the Internet and you've decided to install it on your computer (just to see if what you've heard about it is true or not) and you don't know how to do it? Look no further! This guide will make things very simple for you, as it will teach you step-by-step how to install the latest version of Ubuntu operating system (current version is 7.10 codename Gutsy Gibbon) on your PC in no more than 10 minutes (depending on your computer specs, of course). Are you ready? Let's start! Download the Ubuntu 7.10 Desktop ISO image, that corresponds to your hardware architecture (i386 or amd64), from here. Burn the ISO image with your favorite CD/DVD burning application (Nero, CDBurnerXP, Roxio etc) on a blank CD at 8x speed. 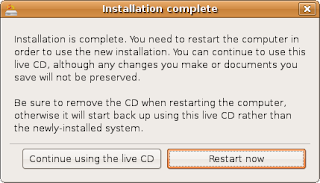 Insert or leave the CD in your CD/DVD-ROM device and reboot your computer. Hit enter when the boot screen appears and wait for it to load into memory. This is the first step of the installer, where you must select your native language (default is English). 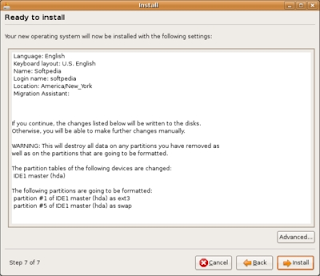 This language will be used for the installer and it will also be the default language for your Ubuntu Linux (when the installation is over). Click the Forward button after you have selected your language. 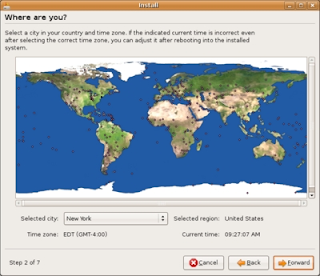 The second screen will feature a map of the Earth with little red dots, so you can select your city and country. Upon the current selection of your location, the time for the final system will adjust accordingly. You can also select your current location from the drop down list situated at the bottom of the window (recommended). Click the Forward button after you have selected your location. 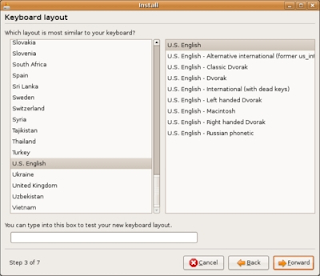 On the third screen, you will be asked to select the keyboard layout that suits you best (default is U.S. English). You can also test your keyboard on the little text input field situated at the bottom of the window. Click the Forward button when you have finished with the keyboard configuration. 1. If you want to keep your existing operating system, select the first option: "Guided - resize the partition and use the freed space". 2. If you want to delete your existing operating system, select the second option: "Guided - use entire disk". 3. Manual is the third choice at this point and I strongly suggest you to use it ONLY if you are an expert on Linux partitioning. Once you've reached a decision, click the Forward button. This is the best part of the installer, as it will allow you to choose your existing Firefox bookmarks, wallpapers, Internet Explorer favorites, Yahoo Messenger or AOL Messenger contacts. If you don't have a Windows or other Ubuntu installation on your hard disk, then you will not see this screen so just click the Forward button to continue with the installation. Here you must do exactly what the title of this step tells you to do. 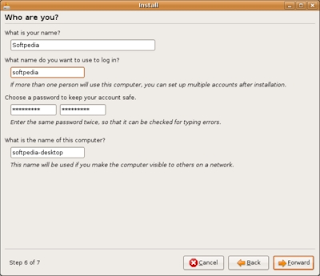 You must fill in some fields with your real name, the name you want to use to log in on your Ubuntu OS and the name of the computer (automatically generated). Once you have finished with this step, click the Forward button again (for the last time). If you have successfully arrived at this point, then you are definitely ready for your new Ubuntu operating system. So, what are you waiting for? Click the Install button NOW! You've probably clicked the "Restart now" button, because you were very excited to see your new Ubuntu operating system at work. Well then, enjoy using it!